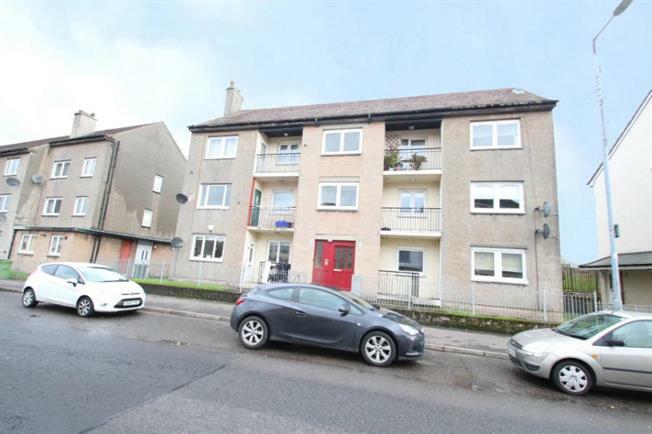 2 Bedroom Flat For Sale in Glasgow for Offers Over £50,000. Two bedroom first floor flat conveniently located within the Main Street, handy for all local amenities including transport and shopping. The property is attractively priced and will appeal to a wide range of buyers. The accommodation on offer comprises, spacious lounge / dining room overlooking the front of the property. The lounge has a door which provides access to the balcony. The well equipped fitted kitchen has a range of wall and base mounted storage units. There are 2 large double sized bedrooms and family bathroom with three-piece suite. The property further benefits from gas central heating system, ample storage space throughout and well maintained communal garden grounds to the rear. In addition There are lovely rear views towards the Campsie Fells.